I don't know if I have told you. But I do paint. I love to paint. It is a hobby of mine that I used to do a lot of during my stay at home mom days. I paint on canvas, walls, and whatever my mind and my brushes lead me to. I remembered my daughter's room when she was growing up. We would have a different theme every so often. I would paint it to whatever it was she was in the mood for. If I was doing a mural in my daughter's room, I remembered having her engage in the activity by letting her do the background paint on the bottom of the wall. That way, she can have a feel of the paint brushes, the paint, the brush strokes, and cultivating her artistic abilities at the same time. Through those experiences and my husbands talent in drawing as well, our daughter turned out to be an exceptional artist. She is even planning to pursue a career in the arts. When I delved into my career as a nurse, my paint brushes and the rest of my art supplies were put to the side. 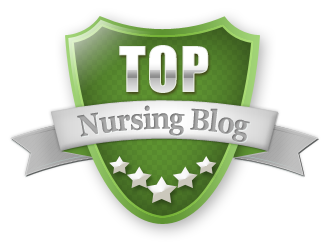 My nursing job became my focal point as I tried to survive each day early on as a telemetry nurse. I have to say, back then, there was no point in my 12 hour shifts where I thought that the career I immersed myself into was artistic at all. It was horrible, discouraging, and sucked the life out of me. It was nothing that I expected for it to be. The apprehension of going to work was overpowering I was scared of "what kind" of patients I was gonna have. Will I have time for everything? What if one of my patients coded? Who's gonna give me the most problem? I focused on the negative. Until one day. I happened to look at my art supplies and thought about painting again. I dabbled here and there. In doing so, it reminded me of how I love to create beautiful scenes. 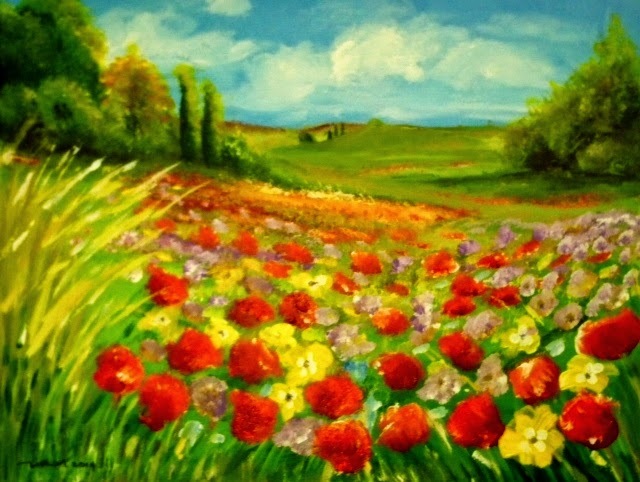 How I love to paint a field of flowers with so many different vibrant colors. How I love to show the distance from the horizon to the foreground of my painting. I simply just found inner joy and strength. Then , I came into a realization that, nursing is so much like painting. Each canvas represents each of my patients. The paintbrushes represents the tools I use to perform nursing skills. The paint represents my nursing judgement, and my thinking process. The colors I choose represents the overall outcome of the message I'm trying to convey through my paintings. 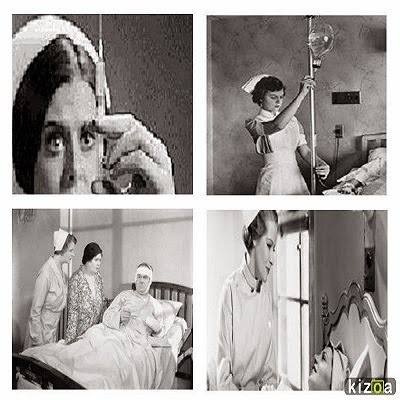 When I made this connection, nursing made sense. I began to embrace its artistry in all aspects. As an artist, each and every brush stroke of paint is a part of a decision making process that can greatly affect the outcome of my painting. As a nurse, desirable patient outcomes can bear upon the choices I make through each interventions in my care plans. I began to care for patients like how I cared for each of my paintings. Each with its own originality and needs. Each with its own perspectives that I need to capture. Nursing became rewarding. Each day brought about an understanding of myself. My appreciation of life grew as I learned how colorful each and everyone one of us could be. My love for the colors stroke an inner desire to start painting to the next level. This was probably brought on due to the fact that I just started a new job. New hope. Fresh perspective. As I shop for new paintbrushes since my old paintbrushes need to retire, I can't help but reflect on my journey as a nurse and as an artist. 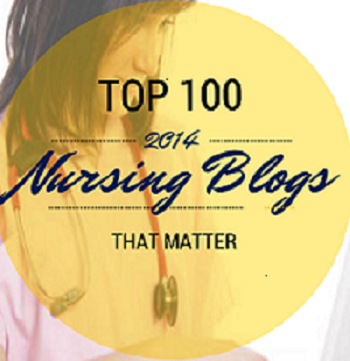 Nursing and art is a journey, personal and revealing. - Tweet that. Paintings can go bad. Patients can go downhill. The most crucial part is knowing that you cared. Cared enough to paint a beautiful picture. A 16x20 acrylic painting. My latest attempt in landscape painting. Well said. One of the best books I've come across in life while researching split brain studies was/is "Drawing on the Right Side of the Brain" by Betty Edwards. I use to draw only cartoonist but then her chapter four taught me how to draw in 3-D realism by utilizing the right side of brain instead of perceiving with my left side. And she's correct how it can benefit in other ways as well, for example when I'm copy-typing something with my left brain I'm apt to making a lot of occasional typo-errors whereas in comparison I hardly make any typing mistakes when using the right side of my brain. Meanwhile, I love colorful sceneries too, like the one you posted. Thanks for sharing it. Tsark out. Ps. I'll soon enough post a summary of my 2-year absence from the Web providing current staff on duty at Google doesn't block me from posting. Take care and thanks again for sharing. By the way, I gotta say this, I had the utmost pleasure and privilege in nurses' aide school where the very first patient I was assigned to was the very first male nurse in America who blazed the trail for guys like me and wouldn't you know it, he was of Filipino heritage.